After having had the opportunity of putting with one of Odyssey Golf’s Versa putters I came away with two strong impressions. First the feel and balance is what we have come to expect from this top line putter company. A solid, confidence producing impact gets the ball on line quickly and distance control is not a problem. Secondly, the contrasting black and white paint scheme was hard to become comfortable with since on the model I was using, the Versa #1, there is no sightline. This however is not true for all Versa models, some of which do have a sightline and of course there is one with the now standard Odyssey 2-ball alignment aid. All Versas have a White Hot insert which of course contributes to the solid feel the putter produces. A new laser milling cutting process allows Odyssey to achieve tight tolerances and to better match insert shapes to the various head shapes – most of which weigh in at 343 grams with the exception of the 2-Ball head which weighs 355 grams. The line has four head shapes from blades to mallets plus the 2-Ball. The #1, #2, #7 and #9 models are available in black/white/black and white/black/white combinations. The #7 90 models are also available in both color options, but feature a front-to-back alignment aid. 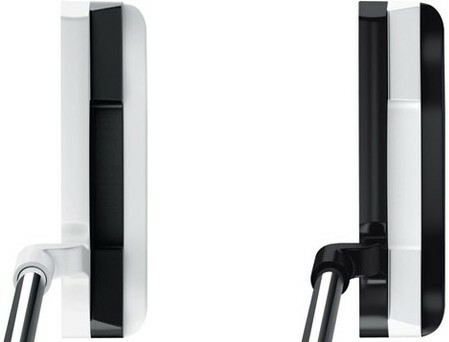 The 2-Ball model comes only in one option, white/black/white. All models carry a price of $169.99 and may be purchased in a 33″, 34″ or 35″ length shaft plus Odyssey’s usual plethora of custom options.